Can I just tell you how I feel about stuffing? Like the full on honest truth? I really don’t like it. Well, wait, I LOVE this recipe (of course I would never share anything that I don’t just love), but stuffing in general? Yeah, I really don’t like. 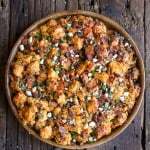 Typically I find stuffing to be kind of just a filler for the Thanksgiving table. For me, there are SO many other delicious things to eat, why would I want to eat soggy bread that’s HEAVY on the onions?? It’s just not really my thing, but I know so many people enjoy stuffing, and you guys, this year I really just wanted to be normal, I wanted to enjoy it too. I wanted to make a stuffing I would LOVE, and one that the family would love too (they are not really stuffing people either…although I think maybe Kai likes it. Typical, he likes the bland food.). SO. I decided a while ago that I was going to tackle stuffing this Thanksgiving. But not in the traditional way that I find so boring and too heavy on the onions for my taste. Nope, stuffing full of flavor and good, good things! A stuffing that in my mind is worthy enough to sit next to my turkey, my sweet taters and my roasted squash on the Thanksgiving table. In general, this stuffing is pretty basic: carrots, onions, garlic, celery, butter, bread, broth, eggs. I didn’t really do anything crazy, I just caramelized some butternut squash and mushrooms, added some of my favorite herbs, reduced the onions (by a lot, so add more if you like onion), added in a little balsamic vinegar with the mushrooms and also just a little Asiago cheese…you know, for good measure. Pretty simple stuff, but I added flavors and textures that I love, and in turn I can now say “I love stuffing”!! Goal for the month = met – Score! SIDE NOTE: I am typing this on my computer. You guys all know how I have a cat now, right? He’s a cute little black cat and if you follow me on snapchat then you see a whole lot of him. Anyway, he is the weirdest cat ever, as I type he literally watches the words going left to right following along intently with his eyes. He does this ALL THE TIME. At first it was cute, but now it has gotten just plain annoying, cause I can’t see what I’m typing. So now when he gets to this point I move him away from my screen…then he goes to his spot…AKA my lap. He’s the best! SIDE NOTE 3: My house does seem to be infested with spiders at the moment and I have to say, it is totally grossing me out. I found FIVE spiders in a cup the other day. Eeww! Can spiders infest your house??? At our old house in Frisco there didn’t seem to be any bugs that could even live above 9000+ feet. We are at the same elevation here, so what’s up with the bug infestation, is it because there used to horses in here? 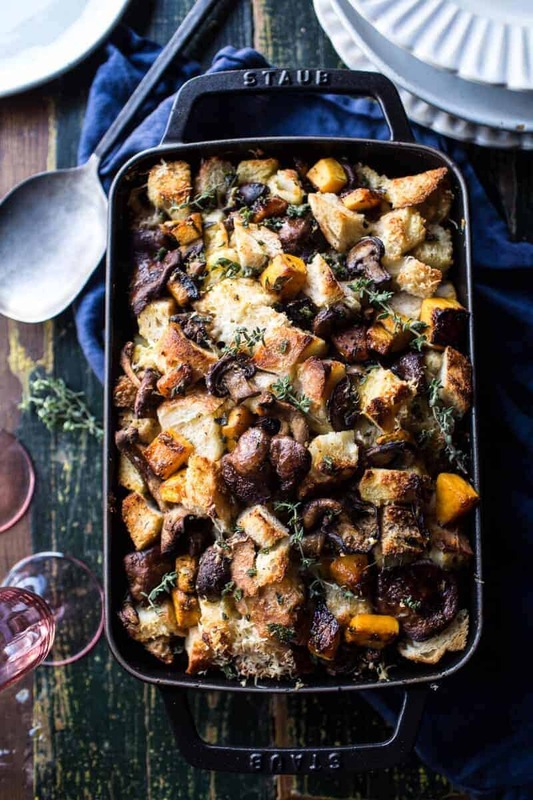 Ok, back to this Butternut Squash and Wild Mushroom Stuffing. I truly love this casserole. It’s moist, buttery and actually full of great flavors and textures. 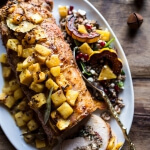 You can prepare it in advance too, which is obviously a bonus come Thanksgiving Day! Oh but question, are you a stuffing “in” the bird or “out” of the bird the person? I am totally an out of the bird stuffing person. Something about cooking it inside the bird weirds me out. Probably because the inside of the bird just weirds me out in general. Anyone else with me there? Pretty simple stuff, but I added flavors and textures that I love, and in turn I can now say "I love stuffing"!! Preheat the oven to 375 degrees F. Lightly grease a 9x13 inch baking dish. Heat a large skillet over medium high heat. Add the olive oil, onion, butternut squash and brown sugar. Cook, stirring often until the butternut squash has softened slightly and the onions are fragrant, about 5 minutes. Stir in the mushrooms, and continue to cook until the squash is fork tender (but not mushy) and the mushrooms have caramelized, about 10 minutes. Stir in the garlic, sage, oregano and time. Cook another 30 seconds and then add the balsamic vinegar and season with salt + pepper. Remove from the heat and add the butter. Set aside to cool slightly. In a very large mixing bowl, whisk together the chicken broth and eggs. Add the bread + Asiago cheese and gently toss to coat. Now add the the butternut squash/mushroom mixture and all the butter to the pan. Gently toss to combine with the bread cubes. Pour the mixture into your prepared baking dish. Cover the dish with foil and bake for 35-40 minutes. Remove the foil and continue baking for another 10-15 minutes or until the stuffing is golden on top. Serve warm. so with you! 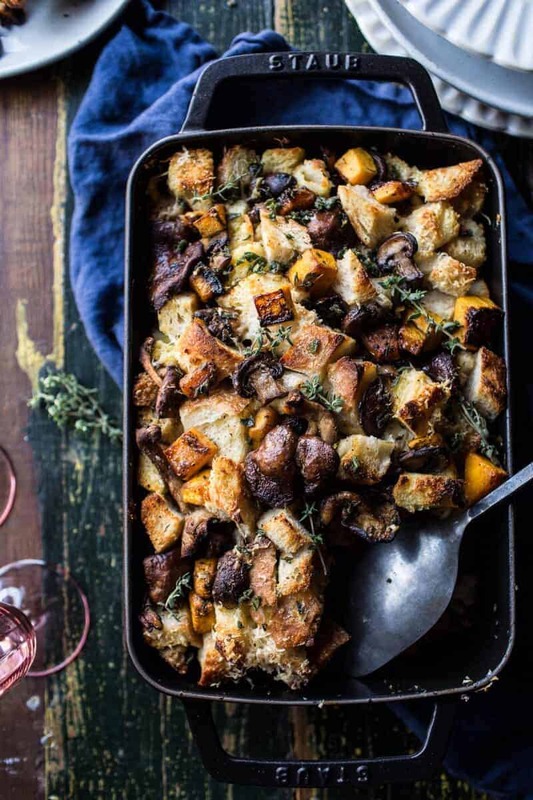 i feel like stuffing is generally very goopy and too soft (i love bread pudding though so not sure what’s going on here). 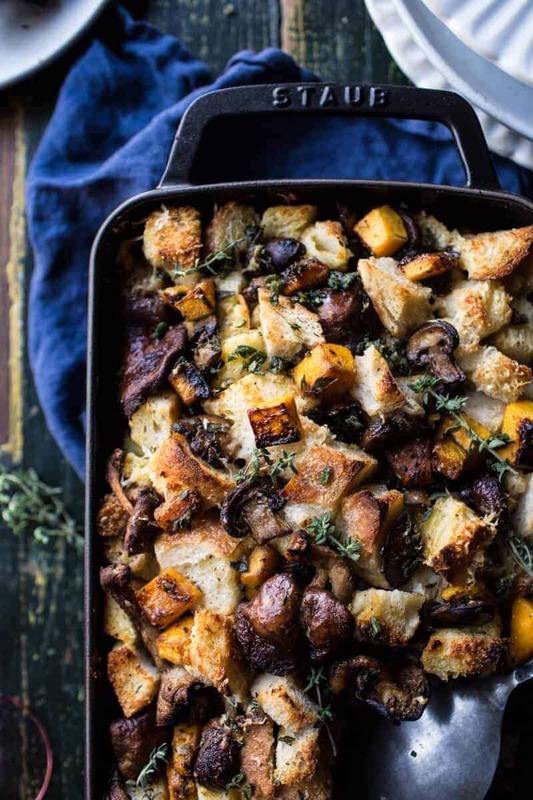 this one sounds super tasty though, since i am a sucker for caramelized squash, and i love that the top of the stuffing gets toasty and crisp and browned! Dunno if you know this, but we don’t celebrate Thanksgiving in Portugal – we are surely not a thankful and grateful people, we’re downright depressive and moody, just look at Fado music aha!! – but I have been always curious about the elusive stuffing. Having lived in the UK for a stint, I spent Christmas there and was made to come face to face with stuffed turkey on Christmas. I did not like it at all!! And still, it stayed there, at the back of my mind, and I wanted to play with it, I wanted to stuff birds (oh dear, this did not come out sounding right!!) and I wanted to stuff them with delicious things… so I had to come up with my own stuffing recipe, and it involves red wine, herbs, stale bread, créme de cassis, raisins and… offal. Yep. I use the bird’s own offal (agaon, it’s not coming out quite right ahahahah), the gizzards, livers, hearts, etc. I cut them very fine, fry it all up and stuff the bird. It is to die for. And now I am presented to this recipe and am like … confused? Do you stuff the bird with this or use it as a side dish? It looks and sounds so yummy, but… it does not go inside a turkey, now, does it?? I have never had stuffing. We have corn bread dressing. We cook it separate, no stuffing the turkey. Some people do put the dressing in the bird, but we don’t. Stuffing is one of the first things gone from our holiday table and it’s not goopy, not a lot of onions…it’s just plain delicious..I make it with regular bread crumbs, corn bread crumbs, celery, onion, sausage, apples and chestnuts…it’s awesome. 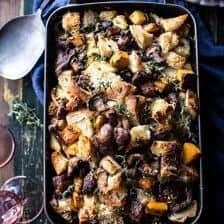 You’re recipe looks wonderful too but if I serve stuffing with mushrooms I’d be disowned so I’ll save your recipe for a Sunday dinner. I do love the flavor of stuffing in the bird, but ever since I heard that the temperature doesn’t really get to the point where it’s…um…safe to eat, I have been worried about it. Also! 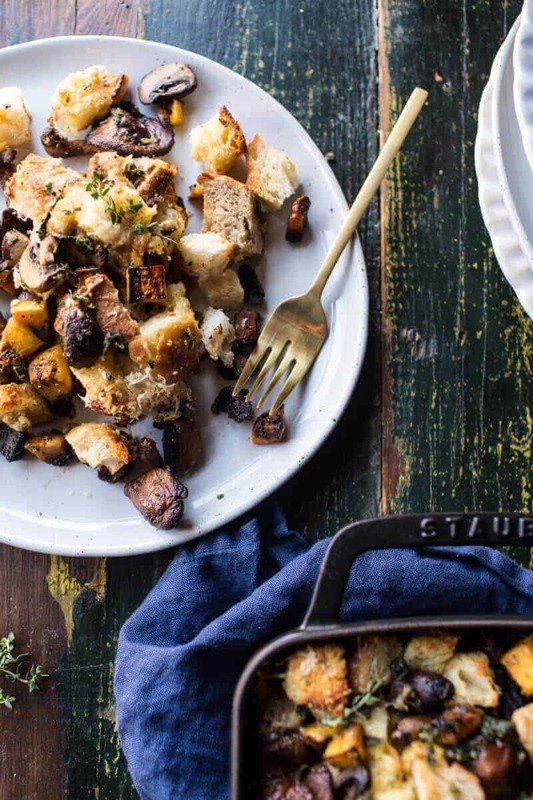 Mushrooms in stuffing are a MUST!!! and here I am lost in thought early a.m. and suddenly, I am hungry because I read your recipe. For the Spiders- Try Lemon Verbena as a natural spider defense. Something about the two don’t mix. Heard that a Lemon verbena soy candles-(Yes, another candle you need) strategically placed around the house gets ride of spiders! Oh that looks SO good – just like everything else you make! Just a quick FYI in the South we usually have “dressing”. It is cooked in a pan (big pan if you are my family) and served with the turkey. But it is pretty much the same ingredients as a stuffing that is cooked in the bird. Looks like I will have to try your version of dressing this year! Thank you! Snape is adorbs and Asher always makes me laugh when you talk about her. 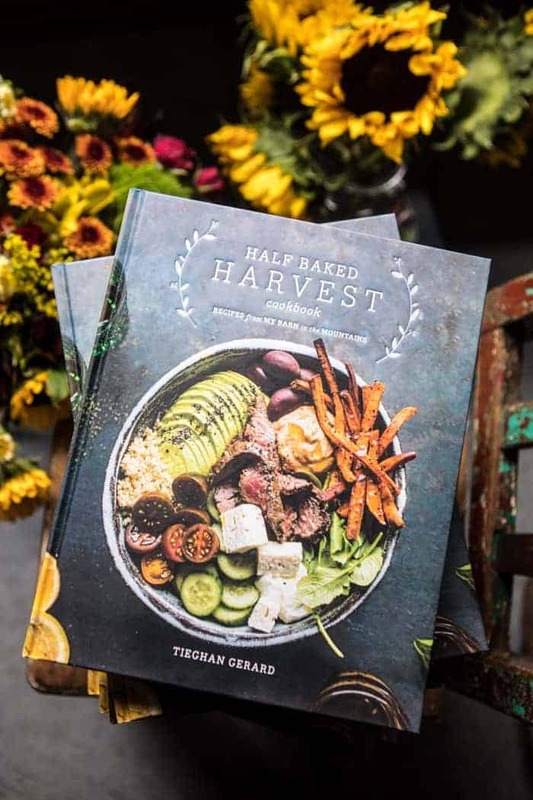 This looks really really good, Tieghan! I have to admit that I’m a big fan of stuffing, but I think that’s because my mom makes a totally non-bland and amaing one every year. She makes it as a side dish and not an actual bird stuffing. I love the mushrooms in yours though, great addition! Definitely want to try this! Stuffing is my favorite part of Thanksgiving! This sounds lovely! Totes agree – stuffing in the bird weirds me out too! 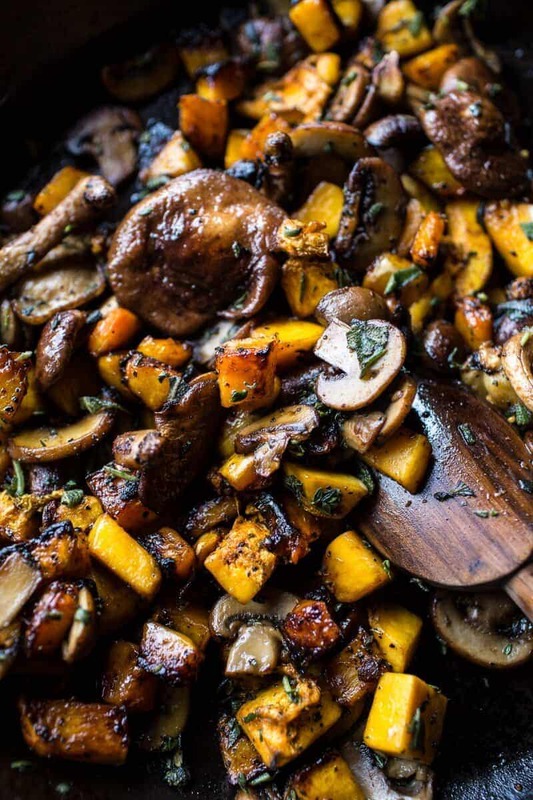 Love this version though, squash + mushrooms is a great combo! Oh my gosh, I LOVE stuffing. (Outside the bird; mine is vegan.) It’s absolutely my favorite, even though growing up we just had stove top. About 10 years ago, I discovered much better versions and I love it even more. I’m not a fan of mushrooms so I won’t be making this version. I have a blended Barefoot Contessa/Williams Sonoma recipe my friend came up with a few years ago that I love. It uses dried cranberries and red wine. LOVE it. I defiantly prefer my stuffing outside the bird because it’s bakes more evenly. Even though this stuffing is simple, all the flavors you have going on makes it a gourmet dish. This looks so delicious! I’ve solved the problem of stuffing in the bird by doing my turkey the America’s Test Kitchen way. Butterfly the turkey and get that old broiler pan that came with your stove, place the stuffing in the pan, put the slotted grate over it and lay turkey on top. Lovely juices and flavors drip down to the stuffing and turkey cooks much quicker and more evenly as it is same thickness across the pan. While turkey rests, brown top of stuffing under broiler. Delicious! I love stuffing (even the box kind which is as basic as you can get but I’ve always wanted to try my own with bacon or sausage and dried cranberries or raisins and maybe other delicious things like butternut squash :o. This recipe looks so good. Well done! For spiders I read that Lemon Eucalyptus Essential Oil is good for keeping them away. I bought it to deal with my silver fish issue but its suppose to work with spiders too. I think cause it’s getting colder they might be coming in for the heat. Also never had stuffing in the bird, doesn’t sound good for you. The stuffing is my favorite food on Thanksgiving . I love it smothered with cranberry sauce and gravy. Your looks yummy. A stuffing in the bird girl. I am surrounded by, and cooking for, men. Men who what piled high traditionally adorned plates of thanksgiving grub. No funny business. However ~ this will be a Delightful addition on any other ‘unnamed’ occasion! Thank you, Maren! Hope you love the stuffing! OH MY GOODNESS TIEGHAN! This looks so good. AND, I was just informed that I am on stuffing duty this year. I think mine needs to include squash and mushrooms now. YUM! Now this is my kind of stuffing! 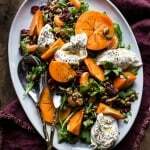 Love the butternut squash and mushrooms! Haha! Thanks Robyn! Have a great weekend! Oh this looks so so good!! We don’t celebrate Thanksgiving in Europe, and so I don’t know much about stuffing & Co. BUT, let me tell you..this one here went straight on my “to-cook-list”! Thanks for sharing Tieghan! I’m hosting Thanksgiving dinner this year and this looks like a perfect recipe to try out, can’t wait! Thanks so much! Hope you love this stuffing! Teighan! We have a house full and stuffing is such a favorite I make 2 kinds! Traditional and something with more of a unique profile! You have just inspired me to try this! 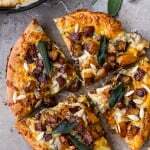 OMG Butternut + Mushrooms = 2 of my favorite ingredients! Awesome! This looks amazing! Here in Iowa there is a thing we do with leftover stuffing. We mix the stuffing with turkey and then put it on a sandwich. It’s like having bread with some more bread. This is something that I had never heard of growing up in Wisconsin, but it is something Iowans eat year round (or at least my husband’s family does). To be honest, it’s pretty delicious, but I bet it would be better with this stuffing and all the yummies you added in! Oh wow, that sounds great! Thank you! Recipes looks great. 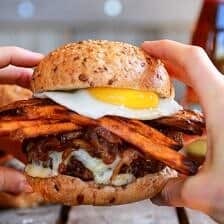 Do you think it can be made the night before and then cooked the next day or partially cook it and then finish it the next day. I cook for 30 so I need dishes I can prep ahead. Help. Thanks Allison! Yes, Either of those options works great! Whatever works best for you. Let me know if you have any other questions. Enjoy! 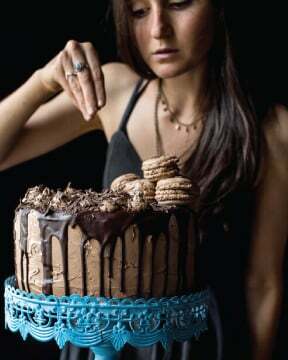 I am going to make this recipe for sure on Thursday. It looks great. Was wondering what you meant by it could be made ahead? I’d love to make it ahead cause my oven will be super full. Do I just prepare everything (say on Wednesday) and then put it in the oven when I’m ready on Thursday? Or do I do everything including the baking, and then only reheat it when I’m ready (i.e. the oven is available!) Thank you so much for this wonderful recipe! You can do either of those options. If your ovens will be full, just bake it wednesday and simply reheat before dinner. If you have space, you can prepared everything wednesday and then bake it off Thursday. Hope that helps and let me know if you have any other questions. I’m wondering the same thing as Ileana! Thanks! Happy Thanksgiving to you and yours! Hello…so with you on the stuffing! I’m going to try this. 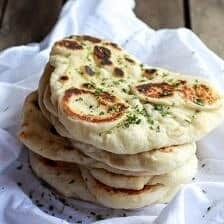 What would you recommend instead of sourdough bread? Hey Dawn! I would use a french baguette or just day old sandwich bread. Really any bread will do. Let me know if you have questions, thanks! This recipe looks amazing. 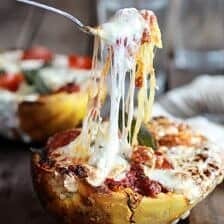 Any tips for making it in a crockpot instead of the oven? HI! I have not tried that so I am not sure. I would say cook on LOW for 6-8 hours, but again I have not tried this. Hi! Can I make this with corn bread instead? I have gluten allergies. It looks delicious! 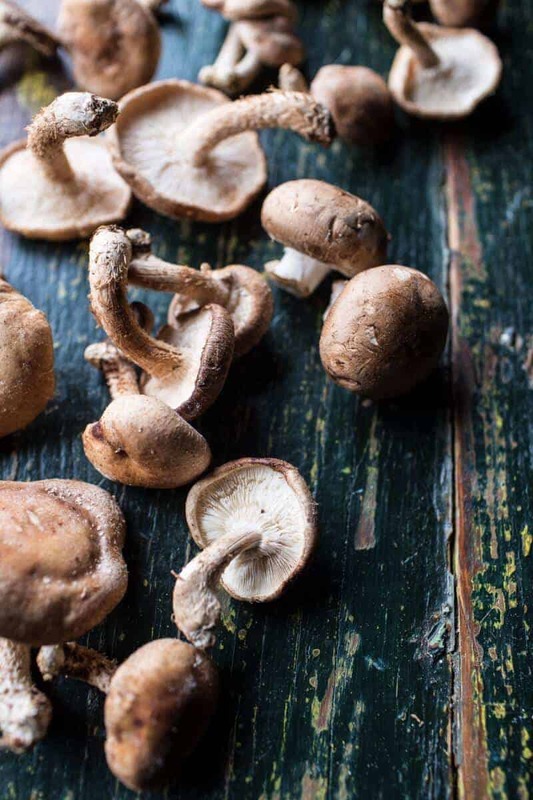 If I can’t wild mushrooms, what store bought mushrooms are a good option? Hey Tieghan! I plan on making this recipe this year, but I don’t think we bought enough sourdough bread. Do you think that adding a little bit of raisin bread will be tasty in this dish or totally throw it off? Something inside me says that squash and mushrooms will be good with it, but my mother-in-law thinks it’ll be the grossest thing ever. Thanks in advance! Hey Kelly! I am sure that will be fine. Let me know if you have any other questions. Okay thank you! I feel like it would be really good for some kind of cranberry stuffing, with dried cranberries and maybe some orange zest, but then again..I’m TOTALLY new to cooking and baking in general, so a cranberry-raisin-orange zest stuffing might night sound appealing to most. Either way, so stoked for this recipe! I think that sounds delish!! I’m sure whatever you decide will be amazing!! Thanks Kelly! I gave it a go and made the recipe. I didn’t have fresh herbs, so I used the powder forms. To say the least, I didn’t look up the exact ratios so it was a bit strong for the sage and thyme. Overall, it was SOOOOO good, but didn’t really mix well with the flavors of the other dishes. I think it’s perfect as a snack, or on it’s own. Now I’m not sure how this would taste, but would adding poultry seasoning ruin it since the stuffing had a sweeter taste? That was the only thing missing was that poultry taste. Sounds delicious! Can you confirm how the butter should be added? Should it be melted first? Thanks! Is it really only 1c bread? Hey there, I have to double this for my crowd. 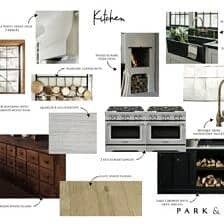 I have a pan that will take a doubled recipe but how much extra do you think the cooktime would be? Thanks and can’t wait to make this! Hey Tieghan! This looks AMAZING!!! Quick substitution question — I try to avoid dairy as much as possible. I was planning on omitting the cheese on this already. Otherwise, can you recommend any way to leave out the butter. I’m sure it adds richness, but could I totally omit or add in some olive oil instead? Made this for thanksgiving and it was INCREDIBLE. Truly the best stuffing I’ve ever had! Thank you! Ps, I noticed someone asked about omitting dairy — I cannot eat dairy and I subbed earth balance for butter/didn’t add asiago on top and it was AMAZING. I am so happy this turned out well for you Sharona! Thank you so much! Wow! Loved it. What a great combo. How can this recipe be made ahead of time? Thanks looks yummy! 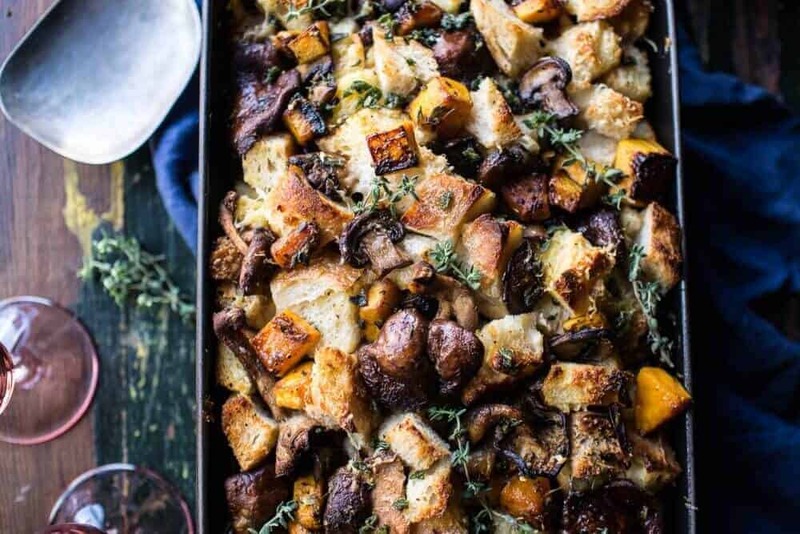 This stuffing looks amazing! If you make it in advance, do you need to modify anything? Or just cook and then pop in the fridge and warm up while the turkey is resting? Thanks for the advice and recipes and Happy Thanksgiving! Like you, I am not a stuffing/dressing fan.. so when I was given this side as the thanksgiving family dinner contribution, your blog was my first stop. Loved this recipe so much – from the choice of sourdough to the incredible blend of spices and veggies together. My mom loved it and told me to make this same recipe next year, which I’m thrilled about since our family has always done the more traditional recipe. Thanks again for another great meal to share with my loved ones! I am so glad your family loved this Jennifer! Thank you so much. I hope you had an amazing Thanksgiving!